We started planning for the Atlantic Row in November 2011. The other rower, Dan Howie, needed a new partner – he asked me, and the rest is history. We only learnt to row last February. Over the past two years we’ve been working on our training schedule (we get up at 5am to hit the gym), and getting our boat and equipment sorted. We’ve also been rounding up corporate sponsors – we want to raise £200,000 and we’re at £40,000 at the moment. We’re competing against around 30 other boats and aiming to beat the world record, which has been held for ten years by a New Zealand pair. So: we’ve got 40 days, five hours and 53 minutes to row across the ocean. It’ll just be me and Dan in the boat, rowing in a pattern of two hours on and two hours off, day and night, for 40 days. We’ll be filtering our own water and eating boil-in-the-bag food. We’ll be battling storms, 50ft waves and rowing in shipping lanes, which means if it’s misty or dark we’ll have to make double sure the ships know where we are. There’ll be sharks around, too. We land in Antigua, and plan on staying there for as long as work will let us, to catch up with family and friends. We’ll be taking a couple of bottles of whiskey to toast the New Year! 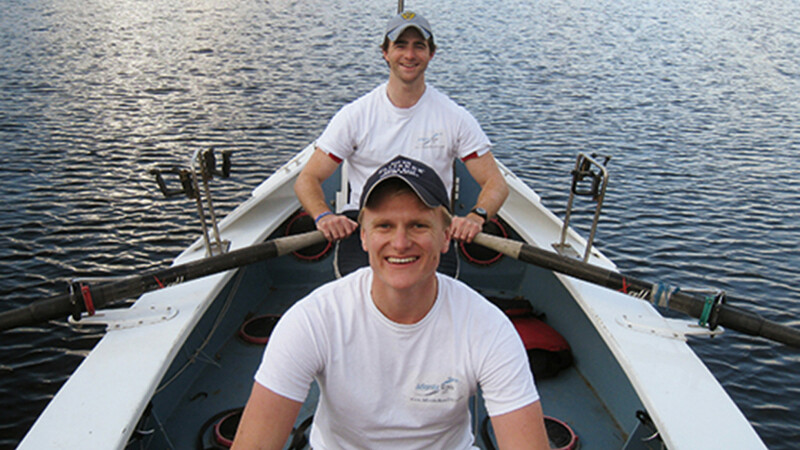 Will North and Dan Howie are rowing the Atlantic for Cancer Research, Leukemia & Lymphoma Research and St Anna’s Children’s Home in Ghana. For more information, visit atlanticrow2013.com.